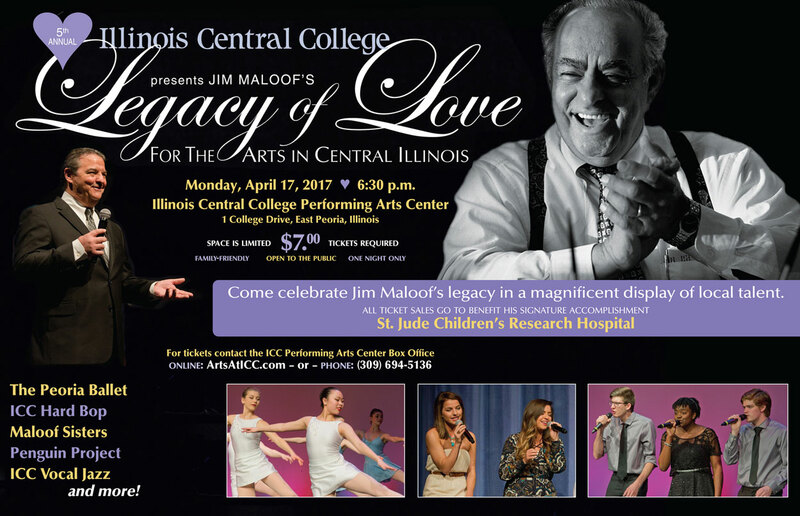 Along with the Peoria Ballet, ICC Vocal Jazz and Hard Bop Band, the Penguin Project, Central Illinois Youth Symphony, the family of former Peoria Mayor, Jim Maloof, and others will join forces and talents to raise money in a one-of-a-kind showcase of entertainment for the St. Jude Children’s Research Hospital Mon., April 17 from 6:30-8:30 pm, at the Performing Arts Center on the ICC East Peoria Campus. Tickets are required and cost $7/per person. Tickets are limited to the first 500 people and can be purchased online prior to the event at ArtsAtICC.com, by phone at (309) 694-5136, or in person at the ICC Box Office prior to the event. The box office is open 10 am to 4 pm Mondays through Fridays (excluding holidays) and one hour prior to public events in the Performing Arts Center. All proceeds from the ticket sales directly benefit St. Jude Children’s Research Hospital. There will be no offering collected during intermission this year. The evening’s itinerary includes professional dance sequences from the Peoria Ballet; an impressive performance by The Penguin Project; barbershop quartets from The Sound of Illinois quartet: Happy Hour, of Bloomington, and The Pride of Peoria, of East Peoria; amazing vocals from ICC Vocal Jazz; knee tapping jazz from ICC Hard Bop Jazz Band; and the ICC speech team. Several members of the Central Illinois Youth Symphony Orchestra will also perform, as well as cast members from Peoria Player’s recent production of Billie Elliott. Special performances by the Maloof Sisters, Markie and Michy Maloof, will round out an evening of fast paced, inspiring, and show stopping local entertainment. The evening is sure to entertain audiences of all ages and will highlight Maloof’s involvement in both the Peoria area arts and in the founding of the St. Jude Peoria Affiliate. Former Mayor Jim Maloof passed away on January 19, 2013. Special guests include Illinois Central College President Dr. Sheila Quirk-Bailey, members of the Maloof family, and ardent supporters of St. Jude Children’s Research Hospital. A cookie and punch reception will be offered at the close of the program, and participating organizations will showcase upcoming and past performances through interactive displays located in the lobby. New this year is a special raffle for a state-of-the-art drone, donated by Peoria Camera. Raffle tickets will be sold on campus and during the evening of the event for $2/per ticket or 3/$5. All proceeds from the drone raffle also will benefit St. Jude Children’s Research Hospital. The winning raffle ticket will be drawn on April 18 at 5 pm. The winner will be notified and also announced on the event Facebook page. The event is one of several the College has planned for its annual Arts Week April 17 – 21. A full schedule of Arts Week events at ICC will be posted at ArtsAtICC.com/artsweek.